Dipping my toes in Caribbean waters has been on my bucket list for some time. So when a chance to visit the Mexican Caribbean flew into my lap one day, I said “Si, por favor!” After approximately 5 hours in the air, I landed in Cancún, Mexico to start my adventures on the Yucatán Peninsula. Whether you plan to take the whole family or just your sweetheart, this tropical Mexican itinerary promises memories to last a lifetime. Since you’ll likely fly into Cancún’s international airport, it’s a great city to explore right off the plane and definitely a hot night spot in addition to central location for ferries making their way to nearby Isla Mujeres. For enjoying all that Cancún has to offer, I suggest the Sun Palace Cancún, only 15 minutes from the airport and an oasis to indulge in everything imaginable, including your own private white sandy beach. An all-inclusive resort, Sun Palace boasts three infinity pools overlooking the turquoise Caribbean waters, a swim-up bar, four specialty restaurants, three lounges and more. Did I mention that every room includes a stocked mini-bar (all-inclusive amenity), in-room wine service, and a two-seater hot tub? Included also is free transportation to other area Palace resorts such as nearby Moon Spa & Golf Club, which is home to the only Jack Nicklaus Signature Golf Course in Cancún. Also off property, you cannot miss the fine tequila tasting and authentic Mexican cuisine at Restaurant La Destileria. Take the “Tequila Tour” and devour their Charred Fresh Cheese, I did! Just south of Cancún, the Riviera Maya is a protected area by the government, full of culture and ecological activities and some of the most fantastic archaeological sites are found here. 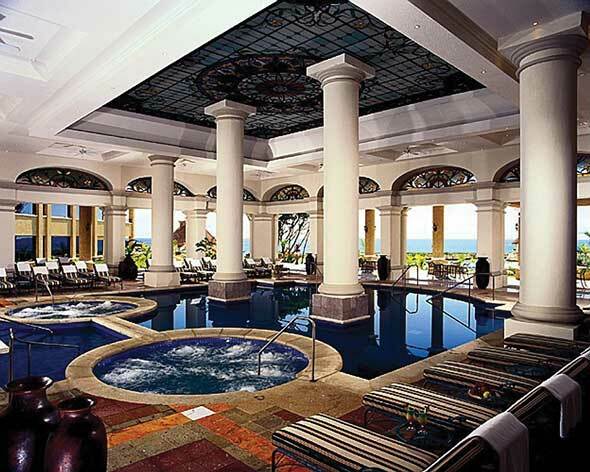 Also here is my favorite place to stay for all-inclusive luxury – Aventura Spa Palace. 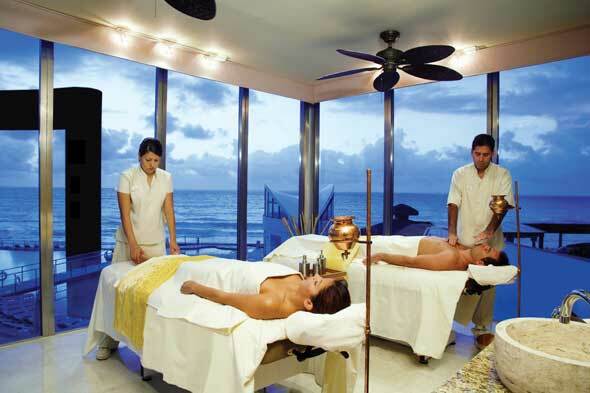 This heart-of-Riviera-Maya locale is an adults-only resort (don’t worry, there’s the Aventura Cove Palace just next door, for the family option), and is designed for mind and body with its grand spa of 76 treatment rooms. 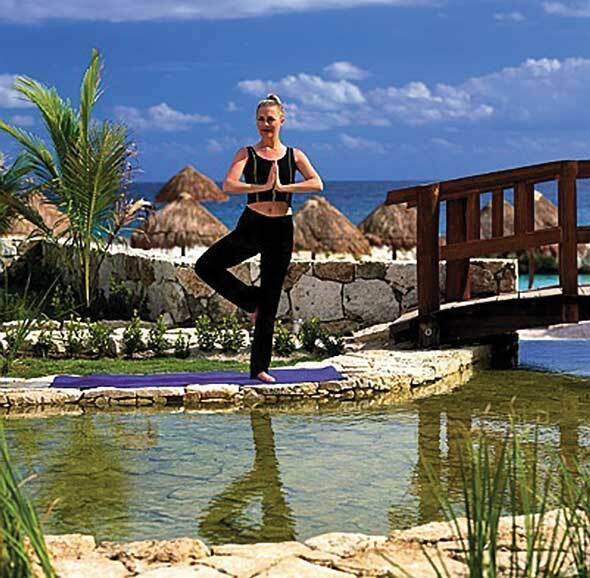 Pampered relaxation continues at a yoga hut, meditation garden and labyrinth Zen path…or at one of the four top-notch restaurants on property. Whatever your mood, you can choose from lounging at one of the waterfall pools, or try the 100-foot climbing tower, 14-obstacle fitness trail, spinning room, dive tank with scuba lessons, snorkeling, kayaking…and the list goes on. While I could probably write a short novel on all there is to do and see on this patch of Mexican paradise, I’ll narrow it down to my three favorite activities to recommend. First on the docket, you MUST catch a boat from Marina Aquatours in the Cancún hotel zone (not far from Sun Palace), which will take you to Isla Mujeres…where the amazing Dolphin Discovery Cancún compound awaits. You will flip for the Dolphin Encounter experience, which gets you right in the water alongside beautiful dolphins that you not only dance and play ball with, but they will also give you a speedy ride with their dorsal tows…I felt like I was flying! You can meet (and touch) manatees, sea lions and stingrays too. It’s life changing.